FAMOUS MATHEMATICIAN - Benjamin Banneker was a free African-American almanac author, surveyor, naturalist, and farmer. Born in Baltimore County, Maryland, to a free African-American woman and a former slave, Banneker had little formal education and was largely self-taught. 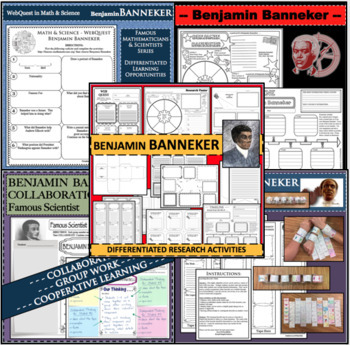 Engage your learners in FUN, INTERACTIVE, and CREATIVE ways while learning about BENJAMIN BANNEKER using a multitude of resources to investigate and discover interesting facts about this famous scientist.